Lake Arrowhead / Often called the "Alps" of southern California, Lake Arrowhead is nestled in the majestic mountains of the San Bernardino National Forest. A beautiful mountain resort, Lake Arrowhead features outlets for outdoor recreational activities that include hiking, backpacking, bicycling, snow and water skiing, boating and fishing. A natural peacefulness has lured buyers with means to Lake Arrowhead since the turn of last-century. The Seven Gables Estate, itself, backs up to the National Forest and often is graced by the presence of grazing deer adding to a way of life in nature. The Lake Arrowhead Development company was formed in 1960 by three developers from Los Angeles. They built the present day 18 hole golf course and club house and subdivided 18 residential tracts. In 1967 the Lake Arrowhead Development Company merged with the Boise Cascade Corporation and additional subdivision properties were created. After several turnarounds of one kind or another common to the growth of a community, the property owners in Arrowhead Woods bought Lake Arrowhead in October of 1975 from Boise, and Boise sold their remaining holdings in Lake Arrowhead to Metropolitan Advertising Agency in 1977. In 1978 a group of investors headed by developer George Coult bought the Village and Lodge properties. In April of 1979 a Burn To Learn exercise was conducted by the Lake Arrowhead Fire Protection District with the San Bernardino County Fire Departments and the Air Corps taking part. All structures in the Village, quaint but aging, were burned in this controlled burn except the original dance pavilion, post office and bank. The beautiful new Village was then built. Lake Arrowhead Village is the area's main hot spot for both visitors and locals. With a variety of unique fashion boutiques, outlet stores, restaurants, and a supermarket, The Village provides excellent shopping and dining before heading back to your cozy mountain top residence. Lake Arrowhead is an unincorporated community and a census-designated place (CDP) in the San Bernardino Mountains of San Bernardino County, California, within the San Bernardino National Forest, surrounding the Lake Arrowhead Reservoir. Lake Arrowhead consists of six communities including Lake Arrowhead, Twin Peaks, Blue Jay, Cedar Ridge, Sky Forest, and Rim Forest. The population of the CDP was estimated at 12,424 in the 2010 census. In the California State Legislature, Cedar Ridge, the lakeside community within which The Seven Gables Estate is located, is in the 23rd Senate District, represented by Republican Mike Morrell, and in the 33rd Assembly District, represented by Republican Jay Obernolte; in the United States House of Representatives, Cedar Ridge is in California's 8th congressional district, represented by Republican Paul Cook; all at the time of this writing. One of the most prized assets of the area is that it truly experiences four distinct seasons. Lake Arrowhead weather offers residents and visitors alike the opportunity to enjoy a wide variety of outdoor activities. Spring / Spring in Lake Arrowhead brings mild temperatures and bright colors as the area bursts with life. Blooms flower, wildlife babies emerge from their winter hideaways, and the sounds of chirping birds fill the air as people visit for a romantic get away from Los Angeles, Orange County, and faraway places. Hiking is a popular spring activity here. There are many hiking trails, with a favorite being the Pacific Crest Trail, located about seven miles away from the Lake, and running from the Mexico border to Canada. Anglers everywhere know that spring is the best time of the year to land a big fish, which brings pros and novices alike to Lake Arrowhead lodging establishments. Whether you're looking to snag a big one or just want to enjoy the experience with a little catch and release, you can cast your jig or bait in the lake or in nearby public Lake Gregory for Bass, Carp, Catfish, Crappie, Kokanee Salmon, Sunfish, and Trout. Summer / Summer in Lake Arrowhead is warm and cozy, without being hot and humid, and the air is clean. The gentle breeze from the lake provides just the right amount of cool during this time of year when water sports are at their most exciting and sunbathing is at its most relaxing. Swimming, water skiing, boating, dock parties, fishing, hiking, bicycling, horseback riding, and more take place during the summer on our lake and in our beach clubs. Those visiting Lake Arrowhead resort properties can make full use of this beautiful private lake and anyone staying at a Lake Arrowhead lodging can take part in water activities at nearby Lake Gregory. And, don't forget that Lake Arrowhead is home to a free summer concert series on Center Stage, from May through September, Lake Arrowhead Village entertains thousands at more than forty free concerts each Friday and Saturday night and on holidays, throughout the summer. When visiting during the summer, remember to take the Lake Arrowhead Queen Paddle boat Tour, which lasts about an hour and takes you around the perimeter of the lake. The notoriously hilarious tour guide has a great reputation for his jokes and one-liners and always has the entire boat in stitches as he points out celebrity homes and tells stories and fun facts about the area. For example, did you know that there have been 120 movies filmed in Lake Arrowhead, including Heidi, The American President, Space Jam, Next, and the 1998 remake of The Parent Trap? Fall / Fall in Lake Arrowhead brings out the red, gold, and orange colors of the mountains, and provides the perfect backdrop for camping. One of the most popular campgrounds is the North Shore Campground. Only three miles from The Village, this beautiful campground features modern lodging amenities for campers, like running water and restrooms. San Bernardino National Forest also provides outdoor activities in the forest with equestrian trails and trails for mountain biking and off road vehicles. With cool evenings and warm days, fall is glorious. Winter / Winter brings fluffy white snow that transforms Lake Arrowhead into an unbelievably beautiful, peaceful winter wonderland. No traffic, crystal clear skies, perfect quiet. Skiing and snowboarding are favorite winter activities at our mountain ski resorts, Snow Valley, Bear Mountain, and Snow Summit. The Big Bear Ranger Station and Discovery Center hosts a snowshoe tour, and several groups offer guided winter hikes, and you can ice skate at one of the world's most beautiful outdoor skating rinks. Plan Your Visit / While outdoor activities abound, there is still plenty to do in Lake Arrowhead if you're not an outdoor person at heart. The area is teeming with shopping, dining, culture, cozy lodging, resort spas, and fun events that boost the reputation of the area as a perfect family vacation spot. The Annual Lake Arrowhead Home Tour takes participants on a tour of some of the most remarkable homes in the community. Whether a historic log cabin with a significant story to tell, or a modern and high tech lakefront mansion, this tour can provide you with a look at the finest architecture and decor Lake Arrowhead has to offer. The Lake Arrowhead Yacht Club, which began operations in 1932 has over 350 members and a fleet of over 35 sailboats and The Annual Antique and Classic Wooden Boat Show features historic wooden boats from manufacturers of the past. As a romantic get away from Los Angeles, Orange County, or anywhere else for that matter, Lake Arrowhead's community has a strong sense of local pride. The economy is mostly dependent on tourism, including lodging, dining, resorts and spas. The primary tourism industries include real estate, lodging, dining, skiing, recreation, resorts, spas, and retail sales. 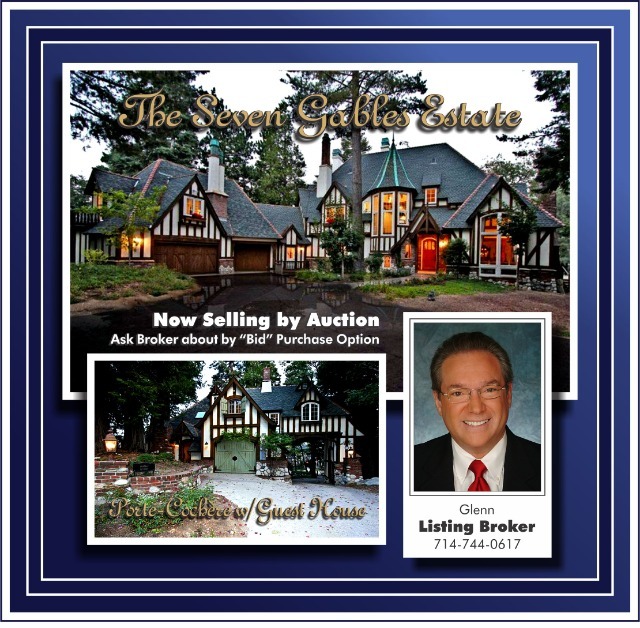 A fantastic fairy tale property, picturesque, enchanting, magical and majestic best describes The Seven Gables Estate in Lake Arrowhead. A fairy tale is a type of short story that typically features European folklore fantasy characters such as dwarfs, elves, fairies, giants, gnomes, mermaids and the like and are distinguished from other types of stories in that they, generally, are explicitly moral tales that tell a tale of something blessed with unusual happiness; thus the fairy tale ending common to all. They diverge from legend in that they are fantasy as opposed to suggestively real. The Seven Gables Estate crosses that boundary in that it is both an image of a fairy tale property host to, possibly, Snow White and The Seven Dwarfs, and a real thing that can be purchased and occupied. Specifically, it is a single family residence situated on lush wooded grounds spread across a lot approximately 1.68 acres in size, mostly flat with a down slope at the rear. It was built in only 2004 by master builder Ron Dolman of the Dolman Construction Company of Lake Arrowhead as his own residence (imagine the detail). The Dolman Construction Company is rated in the top 10% of more than 335,500 contractors in California. Main House / Guest House & Porte-Cochère / Features Include Barbecue, Cable, Ceiling Fans, Controlled Access, Large Surround Decks, Double Pane Storm Windows, Fenced Yard, Carpet, Hardwood and Tile Flooring, Gated Entry, Greenhouse, Hot Tub/Spa, Intercom, Jetted Tub, Mother-In-Law Apartment, Three Car Garage with Separate Parking for Four, Security System, Tudor Styled Open Beamed Ceilings, Wine Cellar, Three Decks, Two Lofts, Indoor Laundry, Seven Custom Fireplaces, Driveway with Bridge, and a Great Room (A True Conference Center if Needed). Room Types Include / Living Room, Two Family Rooms, Kitchen with Breakfast Nook, Pantry, Dining Room, Master Suite and Bath with Walk-In Closet, Secondary Bedrooms, Library, Sun Room, Art Room/Workshop, Indoor Laundry. Three Stories. Artistic Stairway. *Square Foot Range / It is estimated that if you add the two houses, the main house and the guest house, plus the basement and the garage together that the size of the property is approximately 8,052 square feet overall. Then, however, add the bonus room over the garage which is said to be the same size as the garage and the overall square footage comes to 9,120 sq. ft. There is no documentation for this. The original owner said the house is 8,240 square foot in size, thus the number stated above. The tax record shows 6,407 sq. ft. and is likely the house alone. These numbers all are approximate and not guaranteed by broker. No other reference is available at this time. The Homestead / Cedar Ridge / The Seven Gables Estate is located in the prestigious community of Cedar Ridge located on the south shores of Lake Arrowhead. It is home to all custom-built residences ranging in price up to over $5/Million in sale-values since 2008. This testifies to the strong value-position the community maintains among both local and out-of-area buyers with means. The luxurious, gated community made up of wide, clear roadways winding through custom estates features two supermarkets, convenience stores, realty offices (of course) and a variety of small shops. Notably, it's a beautiful place to own and a great place to live. The Seven Gables Estate: home to the good life. Spending time and living "up here" is a way of life, not just a change of scenery. Both the private lake and community offer a safe, peaceful, elite environment. The Seven Gables Estate is now selling by both conventional means and by auction. This is a strong indication of a willingness by the seller to consider reasonable bids. The Seven Gables Estate Can be Seen Most Any Time by Appointment.